– Teaching dyslexic students: how can IPA help? Do we, teachers, know all the symbols? How important is it for us to know and use them? How important is it for students to recognize and use them? Where do we stand with different Englishes, and a chart that focuses on RP? Is the use of the IPA on the decline? phoneme /ˈfəʊniːm/ any one of the set of smallest units of speech in a language that distinguish one word from another. In English, the /s/ in sip and the /z/ in zip represent two different phonemes. A big thanks to our efficient moderators, Shaun Wilden and Berni Wall, who got the ball rolling, kept us on track despite interruptions – both real and virtual – and ‘wound us up’ – in the best sense – at the end. How’s your knowledge? Is it essential to know and use? Cards on the table, it seemed that most of us had a reasonable to good familiarity with the key sounds on the chart, although there are still some sounds many of us have to check. In terms of using the chart, some participants claimed “I can’t imagine teaching (or learning) without it” and “I use the chart everyday with sts at all levels when needed”. Others noted, “I think is it a very useful shorthand to explain things that otherwise take longer but only where it’s familiar”, while another mentioned, “Never felt the need to use it myself”. Some only use the symbols if there is plenty of time, and if the course is pronunciation-intensive. It was generally agreed that there are some sounds which it’s very important (even essential) for teachers to know. There was also discussion on mono- and multi-lingual classes, although not much agreement. Certainly in monolingual classes it is easier, or it helps, to work on sounds which are specifically difficult for that L1, but there are obviously also teachers in multilingual contexts who find the symbols useful. It sees many of us have fun ways to incorporate the symbols into lessons, but there was an overriding feeling that they need to be integrated as far as possible, and not dealt with as a one-off, just on occasion. There are certainly classes where both teachers and students enjoy working with the symbols (for ideas and activities, see below), although skeptics too: “I can understand why you’d find it useful, but I think it’s a personal choice. Never felt the need to use it myself.” And “I understand why I don’t use them” – explaining that it was a question of time and priorities. A couple of people mentioned their students use the symbols, probably in hand-in work, but also suggested that the extent to which those students understood the symbols was dubious! A long vocab list with words on phonetic script is impressive, but not necessarily the least bit helpful if the students doesn’t know what the symbols are, or mean. Now that it’s easy to copy-paste them from online dictionaries, the homework ‘gets done’, but without effect! Finally, it was mentioned that use of the phonemic chart, or the symbols at least, can raise awareness of those sounds not in the students’ own L1; additionally, although students may not be able to produce, to native speaker level, various sounds, an understanding of the sounds and the differences does help them with listening skills. A few words of caution: some students feel the symbols are ‘a new language’, which can simply add to the overload of information. Learning two scripts (e.g. Ukrainian students learning English) would be particularly vulnerable to this syndrome. Additionally, although many benefits were mentioned of students knowing (some of) the symbols, students of English in the Far East, who tend to demonstrate more anxiety over listening texts, were even more fearful when it came to the addition of symbols, which contrary perhaps to the teacher’s hopes, simply exacerbated the situation. And finally, whether the symbols actually give students more confidence. This remained unanswered. Overall, many felt that yes, we should know and use the symbols, but that it does depend on the contexts and situations we are teaching in. Course books use these symbols to reflect standard pronunciation, but these can also be used to show differences. Some chatters had used the symbols for highlighting specifics in e.g. a Glaswegian or Yorkshire accent. It was stressed, however, that it’s important to address the variation in accent. Several participants agreed that the IPA symbols are representations of sounds, and that speakers of different Englishes also project their sound onto the symbol. Perhaps because pronunciation work as such is dealt with less in the classroom nowadays. Do teachers or students really feel such pron work (with symbols) is useful or credible? Do the students expect to be working with pron symbols? Focus on language production has moved from accuracy-based to intelligibility. On this, if sounds wrongly produced result in a breakdown in communication, then obviously work on symbols might help. I would argue whether “I took my cat to the wet” would actually be misunderstood or misinterpreted, but the point was understandable. Due to the availability of fancy electronic dictionaries which just ‘say’ the word; thus the students can simply listen and repeat, and don’t need to read or understand the symbols. It was mentioned that school reports (‘visits’) tend to note that not enough pronunciation work is done. (It’s easy to ‘X’ a box on a form.) Perhaps IPA seen as a top-down supervisory thing? Overall, I felt there was little agreement, but it made for a fruitful discussion. Here there was considerably more agreement, in that familiarity with IPA helps students be far more independent. They can use dictionaries more effectively, and are thus able to study outside the classroom. (As distance and blended learning become more ‘the norm’, this has to be an important point.) Some participants, although perhaps reluctant to do too much IPA work in class, were keen to point their students in the right direction for self study resources if they were interested. A wide variety of activities were offered. I think that everyone agreed (or would agree), that an overriding consideration is that phonemics are incorporated into teaching, and that they’re not dealt with on their own, i.e. that these symbols are simply part of the whole process. Furthermore I would add (in case I missed it!) that it’s important that the symbols are presented / used / practised in meaningful ways, i.e. in context or in words which students relate to easily. Scrabble with sounds in place of letters: helps awareness of phonemes, and is fun. Warmer / Filler / Vocab revision: pairing students up: each has a word written in IPA. “Find your partner”, e.g. collocations / synonyms / opposites etc. Transcribe a conversation (e.g. someone did this from BBC Radio 4) into phonemic script. S/he told them it was a puzzle. They worked it out. Write a letter to your students in phonemic script (good at start of a higher level course, or on CELTA TT courses). Students reply to you, and write 1-2 sentences about themselves. Using IPA to raise awareness of sound as distinct from spelling. Building up a repertoire of key sounds / symbols for one group; obviously it’s easier if it’s a monolingual group as they’re going to have the same problems, but certain sounds do come up again and again. Although there were pro- and non-app users online for the chat, it was clear that if we were going to use and/or recommend these to students, we’d need to introduce them well and teach them how to use them, but that they can be a very empowering tool. 4. There’s also a guide to using the phonemic chart: a video with Adrian Underhill. Participants felt that, yes, apps are probably useful for students outside the classroom, but beyond that, didn’t feel they had a place in the classroom. It clearly depends, too, on the students’ interests. Another added, that they’re fine “if it’s your thing”. The Macmillan app was praised as being both “a thing of beauty” and “very well made”. Someone mentioned interactive IPA charts (see below, BC site). They exist, but there was minimal discussion, and perhaps it was presumed that in fact they are rarely used. “This is the new British Council phonemic chart. Help your students hear the sounds of English by clicking on the symbols below. Click on the top right hand corner of each symbol to hear sample words including the sounds.” It also includes activities. Please add your comments and your experiences on using IPA symbols with your students – especially if you’re newly inspired. Perhaps we can, still, convince the unconvinced! Rachel Appleby teaches English at ELTE University in Budapest (language, culture, communication skills, business, and methodology, on both the BA and MA programmes). She also teach B.E. freelance and is a teacher trainer (CELTA, LCCI). She’s co-written a number of course books and teachers’ books for OUP (inc. the Business one:one series), and The Business Advanced (Macmillan). She is currently working on two levels of the new edition of International Express (OUP). She is an occasional contributor to the reviews section of the ELTJ. She is learning that twitter and ELTchat can be a life-changing and time-consuming experience! For the half of the world’s population whose first language does not use a Latin script, IPA is a waste of time. 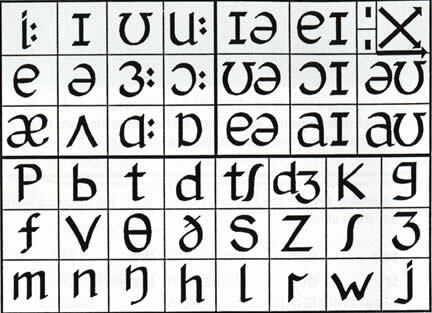 Surely if they can learn and memorise 10,000 characters then it wouldn’t be too much of a challenge to add in 44 more for English, especially given that the majority of the consonants are the same as the Roman letters of the alphabet which they will surely have to become familiar with if they want to read or write anything in English. Is the fact that students are quite capable of learning reasonable English without using IPA a satisfactory reason for ignoring a tool which could improve their English pronunciation further? Working in India, the director of the school said that IPA was useless, that the students would rebel if you tried to use it, etc, but it simply wasn’t the case. Used well, the students reacted really positively and for a country like India this was an excellent told to move what was often very good but hard to understand English towards something that was far more mutually intelligible. I quite understand – don’t complicate their lives! You’ll have read that there were others involved in the chat who weren’t happy / whose students were not keen on using the IPA for similar reasons. What you say about knowing “some reference sounds used within key words” makes a lot of sense. However, I would never use these symbols in isolation: they really need to be integrated and dealt with within a meaningful context. Some teachers and students find them very helpful. Only use the tool if it helps! Thanks for sharing your thougths! Thanks for this article Rachel! I found the IPA chart really helpful during my TESOL training because the students in the training classes were already familiar with it. I’ve just started teaching esl to Arabic speakers and I’m thinking of introducing IPA to them. Arabic is a very phonetic language in that what is written is pronounced and so English pronunciation (especially silent letters and letters that have more than one sound) can be confusing. I’m hoping to experiment with it in the next few weeks and will let your know how I get on! I was an English language teacher for 10 years in Brazil. When I was at the university, taking the language course, IPA did not make much sense at first. However, after taking a book from the local library and attentionly reading its content, I became so addicted to IPA that I included part of the time to teach my students to interprete those “strange” symbols present in their grammars, dictionaries and course books. The result is that my students all agreed that the English language should be transformed into IPA. All of them had better pronunciation compared to those students whose teachers did not emphasise IPA in their classes. I started to learn Arabic and I’m am using IPA to help me learn words. In order to test my own skills, I very often compare the Arabic words with IPA pronunciation and pronounce them before listening to a CD. My pronunciation is extremely close to the tape thanks to IPA system. I don’t know how Arabic people learn English and I don’t know what their techniques are to help them learn English sounds, but I assure you that IPA has been very helpful. I suspect the main reason your students’ pronunciation improved was because you had them practise it, not because you used IPA. As for writing English with IPA; written (typed) English has evolved to be efficient. IPA is not efficient to write or type (even if you changed keyboards). Further, the variety of Englishes is preserved by the diversity in spelling. If one alphabet was used, then there would be a greater possibility of one group succeeding in defining what is ‘proper’ English. I just don’t see the need to simplify a language at it’s expense. Eventually I do see an international language evolving from English (with lots of influence from other languages), that is a simplified version of English. I’m all in favour of IPA for linguists wishing to record, understand and preserve languages. I do not think it is good for teaching the masses. Try writing “forms of English” or “types of English” if you want to get some respect as an educator or English teacher. In the English language, the word English and the words for other languages are non-countable. Are you 100% sure of what you have just posted and did you in fact bother to check the accuracy of your comment? Linguists and respected educators and scholars know that you are wrong – the term “world Englishes’ is included in many standard linguistics and sociolinguistics textbooks, but did you know this, respected educator? I am guessing you did not. Also, apart from not knowing your stuff, what you wrote about the blogger, a highly respected educator, materials writer and speaker, doesn’t commend you. Oh well, it takes all sorts of people to make the world, ignorant blog trolls included. I see you did not mean the blogger but one of the comment writers – you did not even read the post but just came here to troll! Shame!